Daniel Rowan GRIFFIN was born on 22 Feb 1856. He died on 11 Mar 1954. He was buried in Mount Zion Cemetery, , Leake, Mississippi. Daniel married Sarah Pearlie SAVELL. Sarah Pearlie SAVELL was born on 12 Feb 1857 in Walnut Grove, Leake, Mississippi. She died on 28 Nov 1915 in Vessey, Red River, Texas. Sarah married Daniel Rowan GRIFFIN. F i Louvenia GRIFFIN was born on 29 Jan 1877. She died on 26 May 1958. F ii Ophelia G. GRIFFIN was born on 27 Oct 1879. She died on 29 Jan 1963. M iii Isom Eli GRIFFIN was born on 18 Aug 1881. He died on 3 Dec 1972. M iv Thomas Murphy GRIFFIN was born on 4 Jan 1883. He died on 6 May 1981. Dan GRIFFIN was born on 11 Mar 1885 in , Leake, Mississippi. He died on 31 Jul 1978 in , Leake, Mississippi. He was buried in Mount Zion Cemetery, , Leake, Mississippi. F vi Fannie Cora GRIFFIN was born on 16 Jun 1888. She died on 1 Jan 1975. F viii Zora V. GRIFFIN was born in 1894. She died on 29 Dec 1986. Simeon Jones BRANDON [Parents] was born on 12 Apr 1891 in , Howard, Arkansas. He died on 30 Oct 1957 in Ada, Pontotoc, Oklahoma. He was buried in Coalgate Cemetery, Coalgate, Pontotoc, Oklahoma. Simeon married Alice Agusta NOE on 2 Oct 1910 in , Red River, Texas. Alice Agusta NOE [Parents] was born on 5 May 1892 in Palestine, Anderson, Texas. She died on 11 Feb 1982 in Coalgate, Coal, Oklahoma. She was buried in Coalgate Cemetery, Coalgate, Pontotoc, Oklahoma. Alice married Simeon Jones BRANDON on 2 Oct 1910 in , Red River, Texas. Frank BRANDON was born in 1912 in , Red River, Texas. He was buried in Whiterock Community Cemetery, Red River, Texas. Bernice BRANDON was born in 1914. She died in Courtney Flats, Love, Oklahoma. She was buried in Bourland Cemetery, Courtney Flats, Love, Oklahoma. M iii Bruce Alton BRANDON was born on 23 Jul 1916. He died on 7 Mar 1983. F iv Helen Selma BRANDON was born on 28 Apr 1919. She died on 9 May 1993. M v Buel Jones BRANDON was born on 28 Jan 1922. He died on 6 Feb 2000. M vi Bufford BRANDON was born on 19 Dec 1924. F vii Dorothy June BRANDON was born on 14 Jun 1927. F viii Edith Louise BRANDON was born on 9 Jun 1930. Thomas Jefferson BRANDON was born on 21 May 1855 in Atlanta, Fulton, Georgia. He died on 18 Jul 1935 in Courtney, Love, Oklahoma. He was buried in Belleville-Bourland Cemetery, Courtney, Love, Oklahoma. Thomas married Amanda Sulenza "Sue" GILMORE. Amanda Sulenza "Sue" GILMORE was born on 9 Jul 1850 in , Macon, Georgia. She died on 7 Nov 1936 in Coalgate, Coal, Oklahoma. She was buried in Belleville-Bourland Cemetery, Courtney, Love, Oklahoma. Amanda married Thomas Jefferson BRANDON. M i Simeon Jones BRANDON was born on 12 Apr 1891. He died on 30 Oct 1957. Clyde Howel "Ben" WATKINS was born on 23 Jan 1887 in , , Tennessee. He died on 5 Dec 1938. He was buried in Section 7, Row 9, Little Cemetery, Seminole, Oklahoma. Clyde married Martha Rebecca "Mattie" NOE on 7 Aug 1912 in , Red River, Texas. Martha Rebecca "Mattie" NOE [Parents] was born on 20 Jan 1894 in , Anderson, Texas. She died on 22 Sep 1965 in Shawnee, Pottawatomie, Oklahoma. She was buried in Black Cemetery, Pink, Pottawatomie, Oklahoma. Martha married Clyde Howel "Ben" WATKINS on 7 Aug 1912 in , Red River, Texas. M i Clarence Havard "Jack" WATKINS was born about 1915. He died on 9 Aug 1973. F ii Joyce WATKINS was born on 5 Jan 1918. She died on 14 Jul 1987. F iii Ethel Mae WATKINS was born on 12 May 1920. She died on 20 Sep 1990. F iv Claudine WATKINS was born on 31 Oct 1922. She died in 1972/1973. F v Opal Violet WATKINS was born on 7 Aug 1925. F vi Betty Jean WATKINS was born on 11 Jan 1928. Sam W. WEBB was born on 18 Jun 1894 in , Benton, Arkansas. He died on 17 Sep 1988 in Shawnee, Pottawatomie, Oklahoma. He was buried in Black Cemetery, Pink, Pottawatomie, Oklahoma. Sam married Martha Rebecca "Mattie" NOE on 19 Mar 1949 in Seminole, Seminole, Oklahoma. Martha Rebecca "Mattie" NOE [Parents] was born on 20 Jan 1894 in , Anderson, Texas. She died on 22 Sep 1965 in Shawnee, Pottawatomie, Oklahoma. She was buried in Black Cemetery, Pink, Pottawatomie, Oklahoma. Martha married Sam W. WEBB on 19 Mar 1949 in Seminole, Seminole, Oklahoma. John Headrick RAY was born on 7 Jan 1917 in Bartlesville, Washington, Oklahoma. He died on 19 Jul 1999 in Upton, Weston, Wyoming. John married Joyce WATKINS. Joyce WATKINS [Parents] was born on 5 Jan 1918 in Clarksville, Red River, Texas. She died on 14 Jul 1987 in Dickenson, North Dakota. Joyce married John Headrick RAY. John BOYLE was born on 17 Feb 1920 in Butte, Silver Bow, Montana. He died on 31 Dec 1976 in Butte, Silver Bow, Montana. John married Joyce WATKINS. Joyce WATKINS [Parents] was born on 5 Jan 1918 in Clarksville, Red River, Texas. She died on 14 Jul 1987 in Dickenson, North Dakota. Joyce married John BOYLE. Thomas Carroll NOE [Parents] was born on 4 Jan 1896 in , , Texas. He died on 19 Dec 1970 in Sacramento, Sacramento, California. 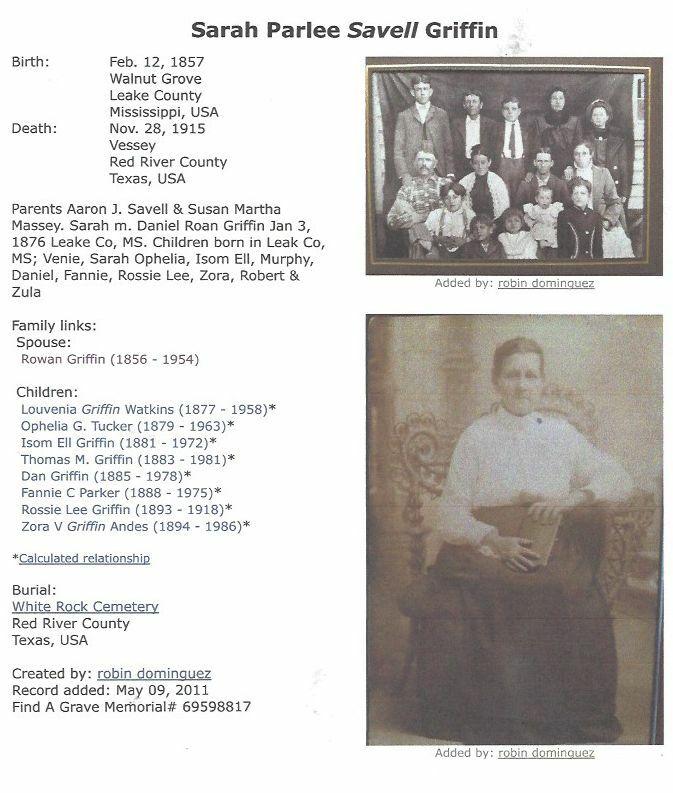 Thomas married Zula Mae GRIFFIN on 22 Dec 1915 in , Red River, Texas. Zula Mae GRIFFIN was born on 13 Feb 1899 in , , Mississippi. She died on 19 Jan 1993. She was buried in Sunset Lawn Cemetery, Sacramento, California. Zula married Thomas Carroll NOE on 22 Dec 1915 in , Red River, Texas. M i Thomas Otto NOE was born on 13 Feb 1917. He died on 26 Jun 1990. M iii Howard Leroy NOE "Sr" was born on 28 Feb 1922. Virginia Claudine NOE was born on 5 Jan 1929. She died on 26 Jul 1930. She was buried in White Rock Cemetery, Clarksville, Texas. F v Dixie Mae NOE was born on 11 Nov 1933. F vi Shirley Jane NOE was born on 25 Dec 1935. John Stanton PRICE [Parents] was born on 3 May 1847. He died on 26 Dec 1916. He was buried in Brigans Cemetery, Red River, Texas. John married Margaret A. NOE. Margaret A. NOE [Parents] was born on 29 May 1851 in , Grainger, Tennessee. She died on 26 Nov 1911 in , Red River, Texas. She was buried in Brigans Cemetery, Red River, Texas. Margaret married John Stanton PRICE. F i Mary L. PRICE was born in Feb 1877. She died before 1910. M ii John W. PRICE was born in Apr 1880. He died in 1927. George L. PRICE was born in Feb 1883 in , , Texas. J. A. COLLINS. J. A. COLLINS married Mary L. PRICE on 1 Sep 1901 in , Red River, Texas. Mary L. PRICE [Parents] was born in Feb 1877 in , , Tennessee. She died before 1910. Mary married J. A. COLLINS on 1 Sep 1901 in , Red River, Texas. Howard COLLINS was born in 1903. Mary COLLINS was born in 1906.